Try our new new deck designer to design your dream deck in real time from your browser and watch it come to life in 3D. With this powerful new tool at your fingertips and over 140 different options, designing your dream deck has never been easier. Take a test drive of our new deck designer and send us your feedback! Customize your deck design using AZEK Building Products materials. Choose from AZEK and TimberTech decking, railing, lighting, accessories, and more. When you’re finished, take away a list of AZEK Building Products materials needed to make your dream deck a reality. In beginning a project, you will be registered to receive information from TimberTech and select partners in our dealer/contractor network who can help you realize your dream deck design. Is there a way to improve the speed of the Deck Designer? Yes, you can use the Settings menu in the toolbar to change the graphics setting to Fastest. This will improve increase the speed of the tool without significantly affecting visual quality. When you’re ready to view your final design, we recommend changing to Fantastic to really see your design shine. 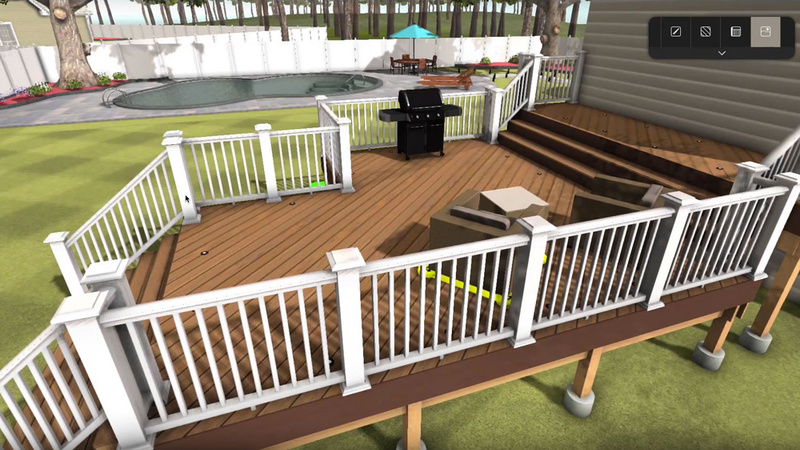 How do I find/contact a local contractor to bring my virtual deck to life? Make your experience using Deck Designer the best it can be by checking these things first. 2-Button Mouse with a Scroll Wheel recommended. Note: Internet Explorer is not supported due to lack of WebGL support. AZEK Deck Designer is not currently fully supported on Android/iOS devices. Before you begin designing, determine the shape and dimensions of your desired deck. This will improve the accuracy of the materials cut list that is provided with your final deck design specifications report. *Keep in mind your deck design is NOT a finished building plan. For your safety, you need to consult a building professional to verify your deck design's accuracy, completeness, suitability for your particular site conditions, and compliance with local building codes and practices. **Opera and Chrome on Windows may relay a Browser Not Supported message from UnityWebGL. Opera does not work on Windows 7.